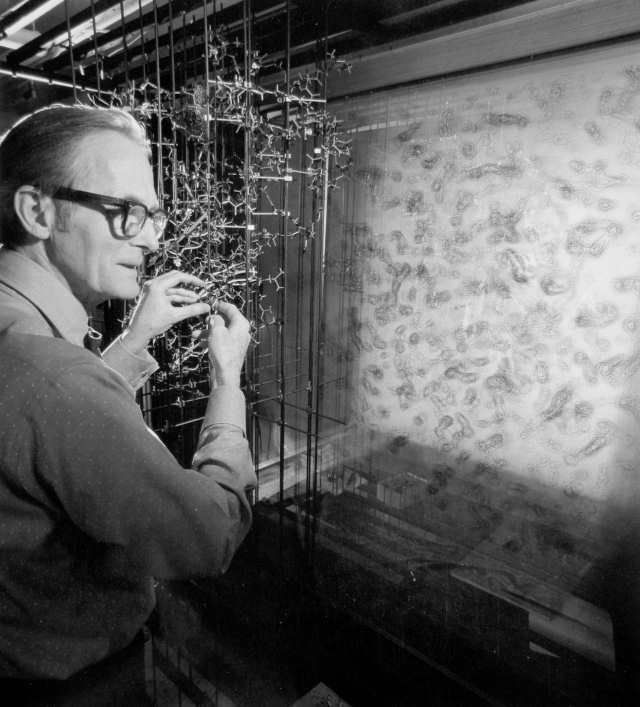 Bill "fitting" a Kendrew model of a protein to its electron density map in a Richards Box. Not in the usual way is Bill aggressive. A more usual, natural aggression goes to the person. Scientific aggression goes to the facts. It is not natural, comfortable, or easy. Bill's scientific aggression is the force of science applied even in everyday life, where in other hands it may not be effective. Bill is not a part-timer. By applying scientific attitudes at all times, the ultimate beyond which there can be no more, he better ensures that work is done scientifically, expands the scope of problems that he can address with science, and improves the skill to do so. It is a conscious decision by Bill, a design to make himself both a better scientist and a better person. Eight things make up Bill Lipscomb’s ultimate scientific aggression in my view. There is little wisdom in the list itself. We already do most that is on this list and do them well, we think. Bill’s wisdom is in how to push these to an extreme at all times. Some people must have help and guidance to succeed. Others do better without help, because help may make them weak and dependent. Bill became stronger both ways, when he had help and when he did not. In high school Bill visited the famous mathematician Fritz John, who lived two houses down the street, for help in figuring out what calculus was. Bill entered the California Institute of Technology as a physics graduate student but soon switched to chemistry under the influence of Linus Pauling. Bill talks about Pauling, and gives the wonderful story of how in graduate school Bill got a grade of C in Economics (in the video, not in the transcript), in “The Life and Work of Linus Pauling (1901-1994): A Discourse on the Art of Biography,” Video: “Reflections.” William Lipscomb (42 min. ), 1995. Jack Dunitz tells a similar story about Pauling's attitude towards mistakes. "[From] Linus Pauling, I learned a lot of things. …. I thought the worst thing that happened to me was that if I would publish something wrong. That is not the worst thing. [Pauling told me that] the worst thing that can happen to you is [that] you publish something that is uninteresting. And Pauling was sometimes wrong about things. Then he went on to something else. And he says to think of lots of ideas and throw away the bad ones. And he didn’t always succeed at throwing away the bad ones. He … published them occasionally. But he had so many good ideas that he really changed chemistry. Also, the Scientific Method is not what people think. It’s not just the systematic collection of data, and then you reason it out and figure out what the principle is, and then you test it and all that sort of stuff. That’s wrong. What you do is you learn all you can around the problem and then make a guess. [Pauling] calls it the “Stochastic Method” to make it sound good. And then see if the guess is right by testing. …. There may be an unhappy side to Bill's remark above that, "[Pauling told me that] the worst thing that can happen to you is [that] you publish something that is uninteresting." Doug Rees, one of Bill's former students, observes that, "Consequently, when Lipscomb discussed his plans to work on boron hydrides with Pauling and was told that this was not very interesting, it could be reasonably interpreted as a criticism. I believe Pauling's reaction still bothered the Colonel years later (despite winning the Nobel Prize for this work). "[Rees2011] I also got this impression in a round-about way in conversations with Bill. Linus Pauling won a Nobel Prize in Chemistry for the nature of the chemical bond, but there was more to learn about it. Bill followed in Pauling’s footsteps in a way, winning a Nobel Prize in Chemistry himself for the nature of the chemical bond. There are echoes from these experiences and quotes throughout the remaining points. Without this step there might be little else. Bill did chemistry projects in high school without a mentor. “Mr. Jones [his high school chemistry teacher] realized that I knew all the chemistry in the course, essentially. He said to me, “I’ll give you my college textbooks in first year … organic chemistry, and all I want you to do is to show up for the final examination.” Well, that was the greatest thing in the world for me because I sat in the back of the room while they were having class and produced an original piece of research (at least it was original to me) bridging organic and inorganic chemistry, making hydrogen from sodium formate and sodium hydroxide. …. I analyzed the hydrogen and found it was pure and wrote it up. I never published it, but [Mr. Jones] certainly made a good decision.” [Quote is from an interview. These events are also documented here]. Bill does some of his own thinking. Bill's college chemistry professors did not teach quantum mechanics because they did not believe in it, so Bill taught quantum mechanics first to himself and then to other chemistry students. In graduate school, Bill found that Linus Pauling was not the hand-holding type, as Bill describes in “Reflections.” William Lipscomb, 42 min., 1995. As a professor, the issue of independence had to do with Bill’s research students. At the University of Minnesota his research students needed so much help that Bill had time for only a few. His research needed more students, so he put out the word that he wanted to move. Harvard was the first to call. Students there were on average tougher, more resourceful, and more independent. At any given time as an active Harvard professor he had about 25 research students and postdocs. It frustrates Bill to hear other scientists talk of what they do after work, to get away from work. He told me to examine what one does for play and make that one's work. Then, with the mind on work at all times one may become really good. As I grew up Bill worked about 80 hours a week: 12 hours a day 6 days a week, plus 9 hours on Sundays. The Lipscomb house was a quiet place. His children became tough, resourceful, and independent. Vacations and holidays were unknown to Bill, except when he attended summer music camp. Henry Cabot Lodge in his own way has both ultimate aggression in his domain and the manner of a gentleman. One could be the most important person speaking to Bill, but if a student walked in the office, the conversation will continue later. When I call or visit Bill it never seems that he is busy. Except only once, when I telephoned his office and he said that the faculty and a student were in the middle of Ph.D. exam, and even then he did not tell me to call back, he asked. Once when Bill had the flu he headed for bed with some molecular models, the kind with the plastic straws for the bonds, and flexible rubber connectors for the atoms. A few days later he emerged to write his landmark paper on the diamond-square-diamond transformation for boron cage polyhedral rearrangement [Lipscomb1966a]. What did we accomplish when we were sick with the flu? squares, and then new bonds form across opposite corners of the squares. In Bill's last paper [Lipscomb2011] his co-author, Evan R. Kantrowitz, remarks in his biography of Bill (Abstract at ACS), "Before his death on April 15, 2011, at the age of 91, he had finished work on this manuscript." Bill appears to suppress all personal aggression to channel that energy to scientific aggression. Dealing with personal issues takes time and energy that does not get chemistry done. Avoid personal problems and forget them, perhaps by speaking of them scientifically, squelching discussion by dropping the bomb of an unarguable fact to avoid argument. Bill uses rhetoric to avoid personal conflict. Bill’s rhetoric is quiet, concise, and lacking personal confrontation except through bare facts. Consider when you thought that you heard Bill give you his heart, and then reconsider that perhaps really he gave you a fact from which you inferred his heart. Example: “He’s giving up,” just above. Then you may have found that it is hard to argue with a fact or with your own conclusions from it. And which of us has not revealed too much, a weakness, and been skewered on it? But as Marydell spoke her heart, all who spoke with her loved her. Bill’s admonition was not meaningful to her. These two spirits would never understand each other. Bill divorced Marydell for reasons that he never shared. He expected that his implications, what he was really saying here, to be understood. It seemed that there might be big money in boron-based high-energy jet fuels. A major American company went around to groups working with boron to destroy them. They tried to steal patent rights to some boron compounds from the University of Minnesota. They also got Bill to commit to a larger research group at the University of Minnesota. with the promise of additional funding, which they withdrew at the last minute. Bill came home to his young son. Postscript: The University of Minnesota in appreciation for Bill's help on patent rights found money for his extra incoming students, and years later the company wrote Bill a letter of apology, saying that they were sorry for what they did and that they did not do business that way anymore. "What is a molecule?" Bill was visiting the home of a professor, who had told his young child that Professor Lipscomb would have an answer. For children so young talk of atoms and molecular bonds would lose them immediately. Bill was so proud of his answer that he told me when he returned home. When I was young, a noted mathematician was to visit. Bill had an idea for a trick, so he coached me on my lines. I asked the mathematician, "Is it five plus seven is eleven or five plus seven are eleven?" The mathematician replied, "Five plus seven is eleven." I smiled, "Five plus seven is twelve." "The slim American Nobel Prize winner, William N. Lipscomb, ... was as relaxed as can be as he played Mozart's Clarinet Quintet with the Asam Quartet from Munich. Like a professional! 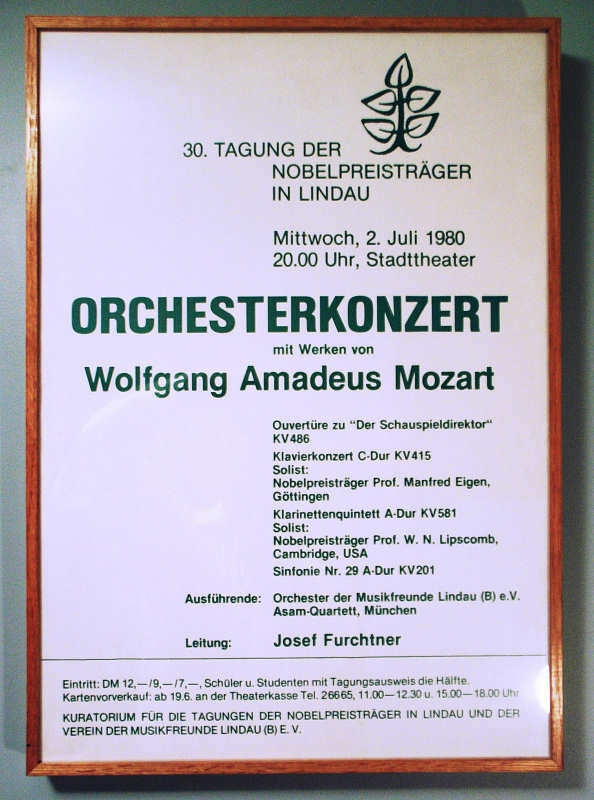 He filled the role exactly that Mozart had assigned to the clarinet: not as a solo part, but an inner partnership, an integrated clarinet-string combination. Striking was the beautiful tone formation of the clarinetist, the evenness of the rise and fall of the musical phrases, and the extended breath control, as if this were the easiest thing in the world! Also the triplet runs were no problem for Lipscomb. Consequently, one could listen with ease to the full excitement of the precious sweetness of the music. ...." - Winfried Wild, 4 July 1980, no. 152 (translated). At a Benny Goodman jazz concert in downtown Boston Bill occasionally burst out laughing. I noticed that when he laughed another instrumentalist was playing the lead, and Goodman turned and pointed his clarinet at the lead player. Later Bill explained that the lead player was mischievously inching up the key changes to bring in more sharps or flats and that when Goodman stared him down the lead player backed off to a simpler key. Nobody else had laughed. Perhaps it was over their heads. When there is a game to be played, tennis, softball, ping pong, chess, or double solitaire. Bill always plays to win. Bill also plays to win his personal fights, but not by fighting. A policeman pulled Bill over while he drove down Massachusetts Avenue in Cambridge, MA. Bill had not slowed down for an intersection. The law is that one must slow down at every intersection. This street was one-way, exiting Mass. Ave. It was the end of the month. Bill told me that he would pay the ticket. He said to think of it as making a contribution to local government. He was trying to convince himself to put this behind him. His rationalization was a kind of white lie, the most that Bill ever lied. One giveaway is that he spoke wistfully. We shall hear him speaking wistfully again. This might be considered passive-aggressive behavior. Bill handles attacks in this way when he can. By doing nothing his victory was to give science an extra day of his work. In England the salesman at the tailor shop measured Bill for a new suit. It became clear that Bill would pay in dollars. The salesman became concerned that delay in converting dollars, which were in decline, to pounds might reduce his commission. The salesman pushed the American out the door, literally. A normal person might have argued that this is hardly the way to treat an Honorary Don at the town's University. Bill, rather, made the facts known around the University's High Tables. Later, at home near Boston a package arrived from the tailor shop with the completed suit and a request for payment at Bill's convenience. (I do not recall if this story is from Bill’s visit to Oxford University or to Churchill College, Cambridge, England, where Bill was an Overseas Fellow -JL). At the Hermitage museum in Russia Bill asked if he could see a section of that he had heard about, but which was not usually open to the public. The official looked up and down Bill's slim, athletic figure before saying no. A normal person might have argued. Bill is not normal and does not engage in non-scientific argument. Bill told me that he believed that the head-to-toe inspection was a way of communicating that he was not fat enough. He explained that being fat was a status symbol in Russia, reminding me of news footage of Politburo members. I mentally filled in the blanks, as one must with Bill, that fat meant rich and powerful enough to buy too much food and to not do manual labor. Bill may not argue, but he may later tell a story, complete with an educational insight. The United States federal government kicked Bill out of boron chemistry research. The Mansfield Amendment of 1969, which affected the Military Authorization Act in fiscal 1970, stopped the military from funding research with no acknowledged military application. Other government agencies would not fund Bill’s boron research. He spoke to me of losing an entire career of research into the nature of the chemical bond by way of boron chemistry. I shall not summarize. Here is everything Bill said to me over the years on this subject (the quote and two paragraph that follow). “Nowadays, research must be - relevant. Once the amendment passed, the Office of Naval Research wrote to Bill suggesting that he withdraw his request for a continuation of funding, because the inevitable refusal would reflect badly on him. Bill wrote back that no, he would not, and that their funding refusal would reflect badly not on him but on them. Somewhat to the government's credit, after Bill won the Nobel Prize in Chemistry for his boron work a year or so of additional funding was made available. But what of ultimate confrontation, when a man is pushed so hard that he must respond? Will not the quiet man be made to shout back, and stories of his non-confrontational character be put to lie? I have been there. Bill throws up his hands, says, "Oh, for heaven's sake! ", and leaves. A good way to expand scientific discourse to solve people problems is to have little alternative. Bill was evidently unaware that this is a well-known management principle that in organizations hard choices, where the better alternative is not clear to lower-level employees, are likewise kicked upstairs to higher management, who are less qualified to decide than those close to the problems, but alternatives being nearly equal, it matters little which way the decision goes. Bill was unaware, I believe deliberately -- that he chose not to study books on management. How else to explain this odd gap in his otherwise wide knowledge of art, music, etc.? This would be consistent with Bill honing and strengthening his own scientific approach to human problems. Bill visited another lab where a student asked about a problematical result, Bill replied that yes, he knew why. In this case the samples were impure. But when the student replied, “Well, I did not get that out of the paper,” Bill did not know how to respond. The student’s statement did not logically follow. The explanation not being in the paper was the reason that the student asked. The student had an idealized and false view of the refereed scientific paper as the only trusted source of scientific knowledge. It is not hard in such a case to employ the rhetorical technique of agreeing with your adversary, and then to logically follow through the consequences of that agreement to show their position to be untenable. Again, Bill does without such rhetorical skills, and I believe his choice to be deliberate. I have heard that Bill is considered by many to be immodest. But I conclude that he seeks only to be correct, which usually sounds immodest, sometimes modest. In “Reflections.” William Lipscomb (42 min. ), 1995 Bill could not tell the story of his big baseball accomplishment without a technical description of the exact variant of baseball being played, so that the accomplishment is not oversold or undersold Later in that presentation, Bill gives his views of who discovered the structure of the protein alpha helix without regard to whose toes he might be stepping on, focused only on attributing credit correctly. Scientific accuracy can sound immodest, as told by Yuan Yuan Chiu in "Only one paper was interesting." Bill's sense of humor may not be helping on the perception of immodesty. 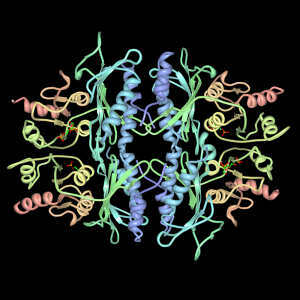 Bill's group determined the structure of carboxypeptidase A, the largest molecule whose structure was determined at the time. Bill had a desktop brass model made (by Kathleen Seyfarth) of the overall shape. If no question, a little prodding. "You're supposed to ask why it's gold plated." "OK, why is it gold plated?" "Because solid gold would be too expensive." This may be the joking side of a serious, scientific observation by Bill. Bill seeks to say or to hear correct statements that are outrageous, because, he told me, that they were most often the most important or insightful. Examples are sprinkled below. One place for the outrageous but true was teaching. He told me that if by the end of class he did not have his students shouting at him, that he would not consider the class to have been entirely successful. "The stars are too hot to burn." When Bill read this in an astronomy book [Baker1930] in secondary school, it helped to turn the course of his life towards physics. The seemingly outrageous nature of the statement caught his attention. It could be understood only by physics then little known, and which Bill did not know. But seeking the outrageous was the occasional stretch. I have heard Bill quick to stop a conversation that seemed to give him too much credit, so that he could carefully list the contributions of other researchers. Careful correctness is Bill’s custom. So here are modest-sounding statements from Bill to challenge the reader. In the shadow of the Nobel Prize one might expect modesty, especially if one frames Bill as a normal person. But from my experience these statements are no different from Bill’s everyday rhetoric. The challenge is to read these statements as ordinary and accurate. Chemistry Nobel Prize winner Harold Urey had written the letter rejecting Bill's application to graduate school at Columbia University. Bill recalled thinking as he threw away this letter years later, before he had won the Nobel Prize himself, that there would never be an occasion that he could show the letter to Harold Urey in a way that they could both have a laugh over it. I told Bill that I thought that his boron work though good was not sufficient to win the Nobel Prize in Chemistry and that the Swedish Academy was really honoring him for his three outstanding contributions to chemistry together, nuclear-magnetic resonance, boron chemistry, and large molecule crystallography. He replied that he had independently come to the same conclusion, but that the terms of the Nobel Prize in Chemistry are that it must be awarded for a single thing, a single most important chemical discovery or improvement. Bill was referring to how he did not leave behind his early interest in mathematics and physics but combined them with chemistry as one of the early physical chemists. It is his way of applying Pauling's advice to work on the borderline between two scientific fields. He was joking only by half. "Chemistry is not physics with less rigor. In chemistry there are discoverable guiding principles for systems which are too complex for a "first principles" approach. The nature of chemistry is very difficult to explain to most physicists, in my experience!" Bill collected colleagues too. After high school, Bill and mathematician Fritz John continued to correspond, and Bill says that Friz John was important in Bill’s applying mathematics to chemistry. Bill did not just move from mathematics to theoretical chemistry to structure determination to organic chemistry, etc., he collected these fields for cross-discipline studies in his research, applying mathematics to all of them, and crossing inorganic and organic chemistry by analyzing hints of partial bonding in organic structures. "Anyone could have done it." It helps in cases like this to be a tenured professor and to have no interest in blending in with what everyone else is doing. Setting intermediate goals in a certain, specific way is what Bill told me most separates him from the other high-performers. Bill replied that some of the Caltech (California Institute of Technology) students had succeeded at everything that they had done, choosing easy problems, so nobody cares. Others had tried problems too hard and had failed. What he meant was that they were wrong in thinking that the ultimate aggression is to seek the most success or challenge. Indeed, thinking of any specific level of success or challenge is the key fault. By this he meant that he picked those grand challenges that might well be impossible but that could be broken down into a stepwise path, and that the highest step one can climb to will guarantee the biggest, most significant accomplishment. With Nuclear Magnetic Resonance (NMR), Bill’s goal was to determine molecular structures solely from their NMR spectra, which would be much faster than by x-ray diffraction. Bill's dream even came true for some small structures, but bigger molecules were problematical. With NMR structure determination mined out Bill had to move on. Laying out a general theory of the chemical shift [Lipscomb1966b]. Calculating by these methods accurate self-consistent field molecular orbitals, which were used to study boranes, carboranes, and most notably to carry out an ab initio calculation that produced the first accurate value of the barrier to internal rotation in ethane [Pitzer1963]. Developing Extended Hückel Theory with Lawrence Lohr and with Roald Hoffmann [Hoffmann1962] [Lipscomb1963]. Hoffmann tells the story of the theory's early history [Hoffmann1989]. This theory was extended by Hoffman [Hoffmann1963] and in Bill's lab reconciled with self-consistent field theory by Newton [Newton1966] and Boer [Boer1966]. For Bill’s research in large biochemical molecules he gave me in person a third example, which slips my mind. 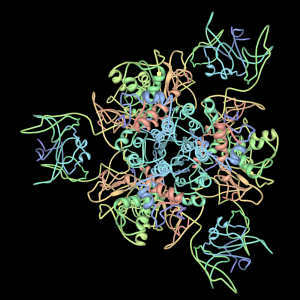 Pioneering determinations of the structure and function of carboxypeptidase A and aspartate carbamoyltransferase, each the largest atomic structure determined in its time. These two intermediate goals succeeded, and their techniques helped to open up the field of large-molecule crystallography (next bullet-point below). Determining the structure and function of leucine aminopeptidase, HaeIII methyltransferase, human interferon beta, chorismate mutase, and also fructose-1,6-bisphosphatase and its inhibitor MB06322 (CS-917) with possible implications for treatment of type 2 diabetes. Contributing to an understanding of concanavalin A (low resolution structure) [Quiocho1971], glucagon [Haugen1969], and carbonic anhydrase (theoretical studies) [Liang1991]. Bill used the stepwise career plan of intermediate goals for his students too. For step 1 whenever possible he gave them a small problem that would be publishable, interesting, small enough for a training task, and yet big enough for a Ph.D. Bill told me that finding these problems was one of the hardest things he had to do. Then, for step 2 he would give them a big problem or make them part of a big project that might fail, so at worst they could fall back on the results of the first problem. I wonder if they understood the career implication. A minimum intermediate goal that Bill set for his students was to publish. Bill says that it is well known that students who do not publish in graduate school tend not to publish afterwards. To further motivate his published students to publish again Bill made them lead authors on publications with Bill’s name last. Exceptions were extreme cases where he had the idea and did 90% of the work or when the students could not agree on whose name should go first. Bill in using scientific aggression in everyday life had to find ways for it to prevail against a more usual sort of aggression, call it destructive personal aggression. First, the difference between the two. C. P. Snow in his book, The Two Cultures and the Scientific Revolution hypothesized, that the sciences are on the rise, that there are two ways to live exemplified by the scientist and by the artist, that these constitute cultures, that communication between them matters, and that effective communication between them is difficult to impossible. I shall simplify C.P. Snow's two cultures to scientific aggression, as exemplified by Bill Lipscomb, and personal aggression. Personal aggression in my view comes in two forms. Both solve problems by going against the person. Constructive personal aggression solves problems by going to the person in a positive and constructive way. For example in the Last Lecture by Randy Pausch, Randy tells of advancing computer science technically of course but also by techniques of salesmanship, teamwork, and thinking quickly on his feet in pivotal meetings. Unlike Bill, Randy talked his way out of his traffic ticket. In Randy’s personal contests there is no loser, only two winners. Constructive personal aggression is good, but it is not Bill’s way. Destructive personal aggression solves problems by going to the person in a negative and destructive way. Many consider sociopaths to be plentiful among business leaders. A person who is sued may hire for the fight the meanest available lawyer among the many such to choose from. Some people choose their politicians this way. Other people are attacked, diminished, or used as things. Facts may be dismissed if they do not align with an imagined reality. Destructive personal aggression is not Bill’s way either. Bill's scientific aggression by contrast solves problems by going to the facts. The percentage of Harvard students who were personally aggressive in a destructive way towards Bill is not high, but it does seem to be higher than anything I saw from students at my college. Harvard has historically aspired to be the proving ground for some of the future leaders of America, if one thinks of leadership in a certain way. Paraphrasing a bumper sticker, “Nice people do not make history.” It is bumper sticker wisdom. As a matter of some change, Harvard has begun to recognize technology entrepreneurship as leadership with the creation of the Harvard Innovation Lab (I-Lab) in 2012, although this new model may include for example the controversial aggression of noted former Harvard student Bill Gates. I shall present in groups students that were problematic for Bill. A conventional presentation would give each group a name, a label, to aid memory and to organize thought. No such luck here. Bill does not label people. Christian teaching is not to call a man a liar. He must be given a way out. He is rather a man who has lied. Bill goes one step further. He will give only the facts, the data, of what the man has done. If the man had lied, it is for you to give it that label. There are those who would drive a wedge between science and religion. Not Bill. Bill’s telephone rang. I was there. It was a student from the Harvard Crimson student newspaper. Previously, Bill had given them deep background on a story, the part not to write, but to help make correct the part to be written. They wrote it all. On another day they said that happened years ago, that they had a whole new staff with a whole new outlook. Then they did the same thing. Bill began to speak into the telephone. He said that because of these past two events he would have no further contact with them. He listened. Then he said the same thing. Eventually the conversation ended..
Bill put in his outer office, which was open day and night, his extra books for his Harvard chemistry students to borrow. His books began to disappear. His first calculus book, gone. For the pre-meds he set up a special library of the books that they would need. Many of these disappeared too, as the pre-meds undercut each other. One may wonder how an intelligent person would trust a reporter, twice, or would twice put books out to be stolen. Bill cannot work with someone other than as equal to his high integrity. He will not adjust. With Bill it is all or nothing. It was Bill’s way of saying that Dr. Take-Charge-Guy was foolish, having made this career choice, which when combined with his tendency to give up easily, may make him dangerous. "He was kicked out of one graduate school after another, until the only place that would take him was Harvard." (pause) "To understand that statement you have to understand Harvard Admissions." Within two years Bill saw in a newspaper that Justin Obi was on trial for his life, accused of a double murder in Liberia of Episcopal Bishop Dillard H. Brown and Treasurer Claude Nader, as well as wounding three others. He had taught at Cuttington College and Divinity School in Liberia, but for reasons unbecoming an instructor his services were terminated, and he was deported. On November 19, 1969 he re-entered the Republic of Liberia and committed the murders that same day. Patricia Anne Newiss, the Bishop's secretary, whom Obi shot in the mouth, wrote the name Obi on the floor in her own blood in case that should she die the murderer would be known, something like a contest between personal aggression (a bullet) and scientific aggression (data). Justin Obi was hanged on November 19, 1971, two years to the day after the murders. [Obi vs Republic of Liberia 1971] [truecrime1971] [Reffell2011]. Most troubles Bill put behind him. But one trouble stuck. Bill has spoken of it several times. His Harvard graduate students needed shelf space. They found many small boxes filled with old papers in a student office adjacent to Bill’s office. Out to the trash. They did not ask Bill. Bill had planned to use these papers to write his memoirs. It was impossible now to do it right. Most of these conflicts above were with students in the sciences. So an hypothesis is that Harvard selects its science students for their scientific aggression of course, but in some cases for high personal aggression too, perhaps as with some non-science students. These data suggest a disconnect between some Harvard students and faculty. The students, even the science students, are to be future leaders of society, so high personal aggression seems to be valued. The science faculty by contrast are expected only to revolutionize their fields. For them high personal aggression seems not to be a consideration. Such a disconnect would be intentional, of course, since it is not Harvard's plan to produce just more academicians. In these conflicts there was little to no effective communication between Bill with his scientific aggression and others in their personal aggression, in line with C.P. Snow’s hypothesis. There were of course winners and losers. The power of Bill's scientific aggression won many of these conflicts in a way. I was an underachiever. For a way out I looked to my father, Bill Lipscomb, although I could not do the parts about being as smart or working as hard. I took part in a campaign to make Bill’s scientific aggression my own by re-interpreting Bill’s 8 points into 11 points that might work for me. Bill might help me with a single homework problem once every few years when I asked. Evidently he was giving his children what he had, solo responsibility that made us ultimately tough, resourceful, and independent, although performance in secondary school may suffer along the way. No matter. My projects outside of class I did alone, with no mentor, building a computer grading system for my high school and my college art, music, physics, and computer projects and ultimately independent at work. Traditionally, students major in what they enjoy working on. Bill’s advice was similar but more precise, to do professionally what one does for play. In my spare time in secondary school I reread the Mr. Tompkins books, particle physics books, and posed and solved physics problems, so that led me in college to major in physics. As college ended, I looked back to see that in my spare time my play was computer programming, so on to graduate school in Computer Science. I was unprepared and so took a few summer computer science courses. Moderating one’s reach in response to worry and fear was not part of Bill’s advice. As Bill is sparing with words, I listen also to what Bill does not say. Some students and parents dream of particular colleges. I dreamed instead of a Ph.D. and of becoming a scientist. I saw how Bill going to the modest University of Kentucky catapulted him to Caltech, so which college may not matter. It is what one does there. The only important educational location is within one’s own head. Likewise my college was easy enough for me for time on my own initiative and outside of class to win international awards for computer art and to do more precise physics computations using a computer. I also installed the APL programming language on the college IBM 1130 computer and taught the rudiments of the language to Mathematics Professor William R. Jones, who later with Clifford Reiter wrote the book, APL with a Mathematical Accent. These and other undirected projects catapulted me, a little like Bill, to a good graduate school and then on to a good job that I enjoy. Nowadays many colleges have instituted undergraduate science research programs to similar effect. At a better college I might have been consumed by the struggle for grades and come off the end of the assembly line better educated in a way but fashioned the same as the other identical units and distinguishable from them only by being the fourth clown from the left. Since I could not free up time for projects by working as hard as Bill, in college I extended my hours by staying out of the TV room and later stayed away from computer entertainment. This created time and boredom, which then I was free to decide to fill with projects. Like Bill, I was never off duty. Other students sometimes failed to solve homework problems. I treated such problems as not yet solved. In my sleep I solved the day’s problem in recursive functions. The shock of it woke me up. Here too, staying away from entertainment was a first step to shaping the idle time of the mind. When I was young Bill’s wife Marydell told him, “You must talk to your son. You are losing your son.” And so, sometimes at the end of Bill's 12-hour days he would lecture his young son. He would show me for example the Schrödinger equation of the hydrogen atom or how to calculate the Bohr radius of the hydrogen atom from first principles (later letter on this subject), or he would just blow off some steam explaining how some of the concepts that his thermodynamics students found so hard were just not that difficult. In college I faced physics and math problems only with the curiosity, flexibility, and focus from Bill’s private lectures. I had at any given time only a single problem in front of me. No one can be intimidated by just a single problem. I did not even realize until after college that other students dropping out of the physics program may have been intimidated. To win the fight against intimidation is to lose, since that gives intimidation a place at the table, even if an empty place. Fighting intimidation does not produce correct solutions to problems. Related to intimidation is fear. From Bill’s advanced science books on my grade-school bookshelf and from his private science and math lectures I learned how to learn what I could and to put aside what I did not understand. Reading books above my level became easy and natural. There were no questions, no tests, and no visible interest by Bill in whether I understood these books or private lectures or not. I learned not to fear. Bill’s occasional private science and math llectures after work taught me how quantum mechanics is simpler than classical mechanics because with just a few numbers and variables the situation is described completely, and also how partial differential equations are simpler than ordinary differential equations because variables become constants that one can ignore. I saw how these courses would be simple, so of course they were. It is a mystery to me only why such simple courses are called advanced. Perhaps the students bailing out to other majors did not have this outlook. In the two biggest professional troubles of my life, when I showed weakness, I won through quiet, steady accomplishments. Argument, even if seemingly effective, confirms weakness. Scientific aggression was sufficient. They could not get a handle on me. With both my father and grandfather having lost careers, I understood even my biggest dreams to be only directions and options. It is about the journey. My eyes looked down. I saw my shoes. I contracted to a one-week plans and one foot in front of the other every day, uphill if possible. I did not count the years. Personal aggression is between people in a noisy contest to win the day. Scientific aggression is in collaboration with people in a quiet contest to win for the world something lasting. The decision is taken alone in the quiet of the night. The practitioner may not have the eye of the tiger but rather a distant gaze, which may extend little further than to one’s shoes. One of the tenants of a Harvard education is that in mixing with some of the world's greatest minds, students may become greater than had they gone to another university. It is a Harvard hypothesis, not unique to Harvard of course. Recall from above how in high school and in college Bill sought out the greatest minds available, in high school mathematician Fritz John, and in college Bertram Ramsey who believed in quantum mechanics. Combined with Bill's conventional academic skills these additional studies catapulted Bill to a top graduate school, Caltech, and he used this knowledge both there and onward in his career in Physical Chemistry. Recall from above how Bill applied what he learned at Caltech from Nobel Prize winner Linus Pauling (1954 and 1962, whose studies of the nature of the chemical bond Bill extended), not to be uninteresting, which turned Bill to big problems with a plan to set intermediate goals, to work on the borderline between fields, which Bill implemented as studying the quantum mechanics of chemistry, and Pauling's demonstration that Caltech-quality students can thrive without handholding, which showed the way for Bill's plan to move from the University of Minnesota to Harvard to enable him to enlarge his research group. Recall too from above how Bill's accomplishments may have outstripped those of his Caltech classmates despite being judged not the smartest among them in a way. Look to the accomplishments of Bill's students, including Chemistry Nobel Prize winners Roald Hoffmann (1981) and Tom Steitz (2009), plus Ada Yonath (2009) who worked closely with Bill when she was a post-doc at MIT. I may have had elements of a Harvard education at home from Bill through his 8-point list above with my 11-point interpretation. Fred Brooks (Harvard, 1956) at the University of North Carolina at Chapel Hill taught me more when I was a graduate student there. An analysis of his more complicated case of structured problem solving applied to the everyday is the subject of my essay: Trying to Think Like Fred Brooks. At UNC I was one of the four principal builders of GRIP-75 [Brooks1977] [LipscombBrooksPique1981] [Lipscomb1981], a system on which crystallographers claim this milestone: "This is the first instance in which a complete three-dimensional structure [of a large molecule] was solved with the use of computer graphics alone, without the construction of a physical model." [Tsernoglou1977], a neurotoxin in the venom of a sea snake. Another large molecular structure was also solved on GRIP-75 at about the same time [Richardson1977]. 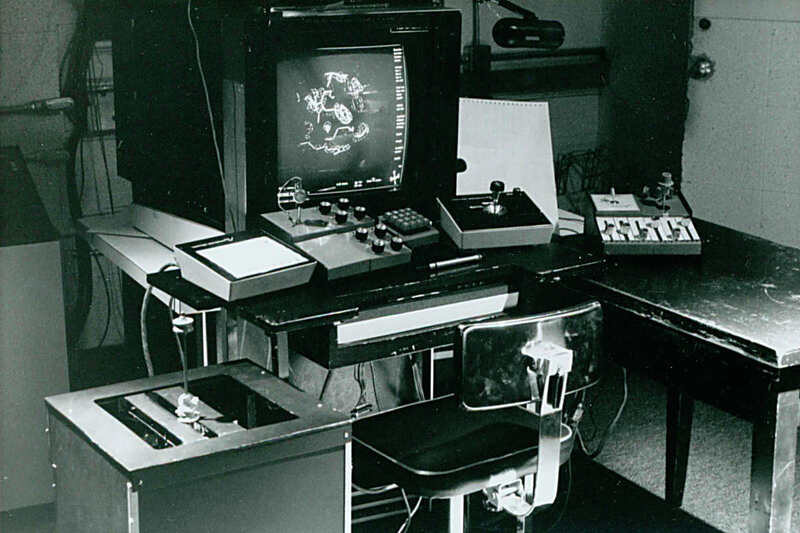 At least two dozen large structures were solved (fitted to their electron density maps) on this system. I became a Research Staff Member at the IBM T. J. Watson Research Center and a Senior Software Engineer at IBM. These five results are data. These data may be consistent with this Harvard hypothesis. Bill Lipscomb read this website in 2009, After reading this page on Scientific Aggression, Bill looked up and said, as I suppose by way of contrast to the other web pages, "This is important. This is what people should read." [Rees2011] Rees, DC, William N. Lipscomb, Jr. - An Appreciation. Periodic Tabloid, Chemistry and Chemical Engineering Division at Caltech Vol 3, No 2, Spring 2011. PDF. [Lipscomb1966a] Lipscomb WN, Framework rearrangement in boranes and carboranes. Science 153 (1966), p. 373. [Baker1930] Baker RH. (1930) Astronomy an Introduction, D. Van Norstrand Company, Inc.
[Longuet-Higgins1955] Longuet-Higgins HC. Roberts M de V. 1955. The Electronic Structure of an Icosahedron of Boron Atoms. Proc. Roy. Soc. (London) A230, 110-l19. [Edmiston1963] Edmiston CK. Ruedenberg K. 1963. Localized Atomic and Molecular Orbitals. Rev. Mod. Phys. 35, 457-465. [Boys1966] Boys SF. 1966. Quantum Theory of Atoms, Molecules and the Solid State. (P. 0. Löwdin, Ed.). Academic Press, New York. 253-262. [Brooks2010] Brooks, F.P. Jr., The Design of Design: Essays from a Computer Scientist. Addison-Wesley, 2010, p. 177. [Abrahams1950] Abrahams SC, Collin RL, Lipscomb WN, Reed TB. Further Techniques in Single-Crystal X-ray Diffraction Studies at Low Temperatures. Rev. Sci. Instr. 21, 396-397 (1950). [Kaufman1949] Kaufman HS, Fankuchen I. A Low Temperature Single Crystal X-ray Diffraction Technique. Rev. Sci. Instr. 20, 733-734 (1949). [Howell1954] Howell, P. A., Curtis, R. M., and Lipscomb, W. N., "The Crystal and Molecular Structure of 1,4-Dithiadiene," Acta Cryst. 7, 498 (1954). [Eaton2002] Structures and Mechanisms: From Ashes to Enzymes 2002, (Acs Symposium Series) Gareth R. Eaton (Editor), Don C. Wiley (Editor), Oleg Jardetzky (Editor), .American Chemical Society, Washington, DC, Chapter 1: The Landscape and the Horizon. An Introduction to the Science of William N. Lipscomb, by Gareth Eaton, 16 pp. ), p. 4. [Lipscomb1977a] Lipscomb WN. The Boranes and Their Relatives. Science: 196(4294):1047-1055 (3 June 1977). [Eaton1969] Eaton GR, Lipscomb, WN. 1969. NMR Studies of Boron Hydrides and Related Compounds. W. A. Benjamin, Inc.
[Stevens1963] Stevens, RM, Pitzer RM, Lipscomb WN. Perturbed Hartree-Fock Calculations. I. Magnetic Susceptibility and Shielding in the LiH Molecule. J. Chem. Phys. 38, 550-560 (1963). [Lipscomb1977b] Lipscomb WN. 1977. The Boranes and Their Relatives. in Les Prix Nobel en 1976. Imprimerie Royal PA Norstedt & Soner, Stockholm. 110-131. Quote in the next to last paragraph omitted from the Science magazine version of the paper. See page 242 of the nobelprize.org pdf. [Pitzer1963] Pitzer RM, Lipscomb WN, "Calculation of the Barrier to Internal Rotation in Ethane", J. Chem. Phys., 39, 1995−2004 (1963). [Lipscomb1966b] Lipscomb WN. The chemical shift and other second-order magnetic and electric properties of small molecules. Advances in Nuclear Magnetic Resonance. Edited by J. Waugh, Vol. 2 (Academic Press, 1966), 137-176. [Hoffmann1962] Hoffmann R, Lipscomb WN. Theory of Polyhedral Molecules. I. Physical Factorizations of the Secular Equation, J. Chem. Phys, 36, 2179, (1962). [Lipscomb1963] Lipscomb WN. Boron Hydrides, W. A. Benjamin Inc., New York, 1963, Chapter 3. [Hoffmann1963] Hoffmann R. An Extended Hückel Theory. I. Hydrocarbons. J. Chem. Phys, 39, 1397-1412 (1963). [Newton1966] Newton MD, Boer FP, Lipscomb WN. Molecular Orbital Theory for Large Molecules. Approximation of the SCF LCAO Hamiltonian Matrix.” J. Am. Chem. Soc. 88., 2353-2360 245 (1966). [Boer1966] Boer FP, Newton MD, Lipscomb WN. Molecular Orbitals for Boron Hydrides Parameterized from SCF Model Calculations.” J. Am. Chem. Soc. 88, 2361-2366 (1966). [Lipscomb1968] Lipscomb WN, Hartsuck JA, Reeke GN, Jr, Quiocho FA, Bethge PH, Ludwig ML, Steitz TA, Muirhead H, Coppola JC. 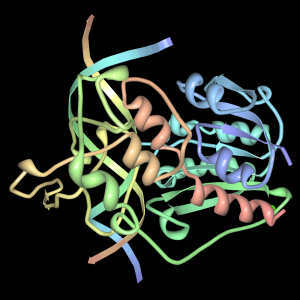 The structure of carboxypeptidase A. VII. The 2.0-angstrom resolution studies of the enzyme and of its complex with glycyltyrosine, and mechanistic deductions. Brookhaven Symp Biol. 1968 Jun;21(1):24–90. [Honzatko1983] Honzatko, R. B., Crawford, J. L., Monaco, H. L., Ladner, J. E., Edwards, B. F. P., Evans, D. R., Warren, S. G., Wiley, D. C., Ladner, R. C., & Lipscomb, W. N., "Crystal and molecular structures of native and CTP-liganded aspartate carbamoyltransferase from Escherichia coli," J Mol. Biol. 160, 219-263 (1983). [Burley1992] Burley, S. K., David, P. R., Sweet, R. M., Taylor, A., & Lipscomb, W. N., "Structure Determination and Refinement of Bovine Lens Leucine Aminopeptidase and its Complex with Bestatin," J Mol. Biol. 224, 113-140 (1992). [Reinisch1995] Reinisch, K. M., Chen, L., Verdine, G. L., and Lipscomb, W. N., The crystal structure of the Hae III methyltransferase covalently complexed to DNA: An extrahelical cytosine and rearranged base pairing, Cell 82, 143-153 (1995). 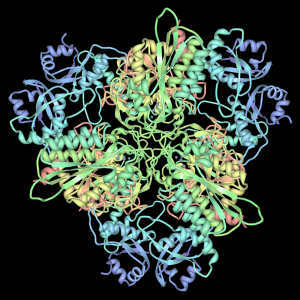 [Karpusas1997] Karpusas, M., Nolte, M., Benton, C. B., Meier, W., and Lipscomb, W. N., The crystal structure of human interferon beta at 2.2-A resolution, Proc. Natl. Acad. Sci. USA 94, 11813-11818 (1997). [Strater1997] Strater, N., Schnappauf G., Braus, G. and Lipscomb, W.N., Mechanisms of catalysis and allosteric regulation of yeast chorismate mutase from crystal structures, Structure 5, 1437-1452 (1997). [Ke1989] Ke, H., Thorpe, C. M., Seaton, B. A., Lipscomb, W. N., & Marcus, F., "Structure Refinement of Fructose-1,6-bisphosphatase and its Fructose-2,6-bisphosphate Complex at 2.8 A Resolution," J Mol. Biol. 212, 513-539 (1989). [Quiocho1971] Quiocho, F. A., Reeke, G. N., Becker, J. W., Lipscomb, W. N. and Edelman, G. M., "Structure of Concanavalin A at 4 A Resolution," Proc. Natl. Acad. Sci. USA 68, 1853-1857 (1971). [Haugen1969] Haugen, W. P. and Lipscomb, W. N., "The Crystal and Molecular Structure of the Hormone Glucagon," Acta Cryst. A25, S185 (1969). [Liang1991] Liang, J .-Y ., & Lipscomb, W. N., "Substrate and Inhibitor Binding to Human Carbonic Anhydrase II: a Theoretical Study," International Workshop on Carbonic Anhydrase (Spoleto, Italy VCH Verlagsgesellschaft, 1991) pp. 50-64. [Obi vs Republic of Liberia 1971] Courtroom transcript, Supreme Court of Liberia. [Brooks1977] Brooks FP Jr. The Computer "Scientist" as Toolsmith: Studies in Interactive Computer Graphics. Proc. IFIP, 625-634 (1977). [LipscombBrooksPique1981] Lipscomb JS., Brooks FP Jr, Pique ME. The GRIP-75 Man-machine Interface. ACM SIGGRAPH Video Review, (4), (Aug. 1981). [Lipscomb1981] Lipscomb JS. 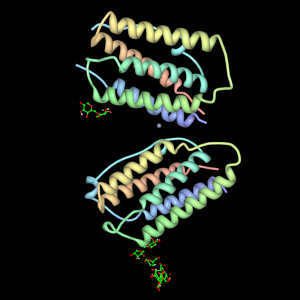 Three-dimensional cues for a molecular computer graphics system. Ph.D. Dissertation, University of North Carolina at Chapel Hill. 172 pp. (1981). [Tsernoglou1977]. Tsernoglou D, Petsko GA, Tu AT. 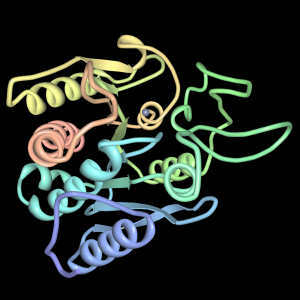 Protein sequencing by computer graphics. Biochem. and Biophys. ACTA, 491(2):605–608 (Apr 25, 1977). [Richardson1977]. Richardson DC. 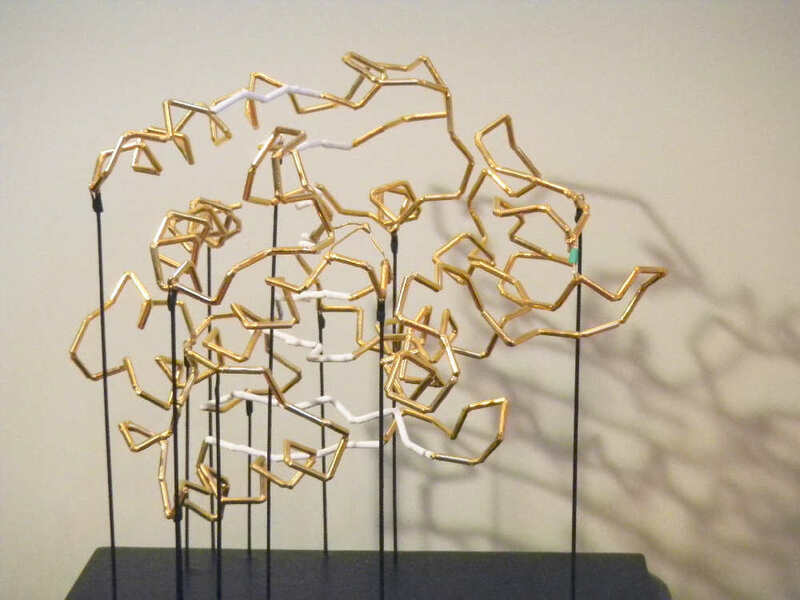 (1977) Three-dimensional Structure of Cu, Zn Superoxide Dismutase, in Superoxide and Superoxide Dismutases. Ed: Michelson, AM, McCord, JM., and Fridovich, I. Academic Press. Bill "fitting" a Kendrew model: From Bill's photo collection, reprinted here with permission from William Lipscomb. Bill playing the clarinet: From Bill's photo collection, reprinted here with permission from William Lipscomb. Diamond-square-diamond (DSD) rearrangement: Hand drawn by James Lipscomb. Bill's concert with the Asam Quartet: Concert poster scanned by James Lipscomb. 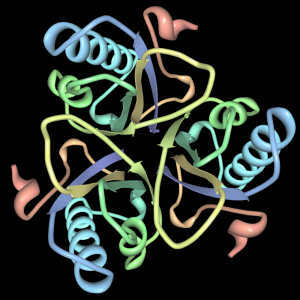 Carboxypeptidase A model: Photo by James Lipscomb. Ethane barrier: Hand drawn by James Lipscomb. Diborane: From Bil's collection, drawn for him as work under a government contract and therefore in the public domain, reprinted on this website with permission from William Lipscomb. Curving lines: From Bil's collection, drawn for him as work under a government contract and therefore in the public domain, reprinted on this website with permission from William Lipscomb. NMR spectrum: The spectrum is reprinted from a scientific paper, which was work under a government contract and therefore in the public domain. The molecule is rom Bil's collection, drawn for him as work under a government contract and therefore in the public domain, reprinted on this website with permission from William Lipscomb. Large-molecule images with black backgrounds: by James Lipscomb using the data from Protein Data Bank and rendered using the PDB Simple Viewer. GRIP-75: Photo by James Lipscomb. "My early home environment ... stressed personal responsibility and self reliance. ...."
Larger versions of some images on this page are available to use under similar Creative Commons licenses from Wikipedia pages on William Lipscomb and on Molecular Graphics.